When we first moved into our house, we knew we wanted a garden but we didn't realize the extent for our love. The first year we built three 4' x 8' raised beds. The following year we added on two more. Then we added on one 4' x 12' lower bed. The final year we added yet another 4' x 12' lower bed! 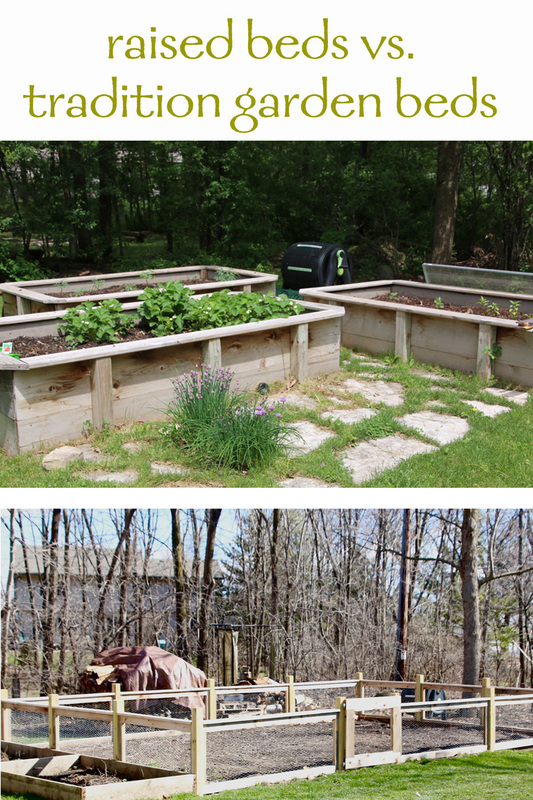 Our back yard was turning into a geometric design of raised beds! We never realized when we started how big they would get. We were simply wasting a lot of great garden space in between the beds that we had been creating. Gardening has turned into a major part of our food supply and we really want to make the most of the space we had. Simply said, the walls had to come down! I was apprehensive though. We spend a lot of time in our backyard, both as a family and entertaining. The garden beds had turned into a landscaping design that complimented the look of the yard. I did not want to turn our yard into a chicken-wire mess. Luckily, my friend made a garden for his parents earlier in the season. 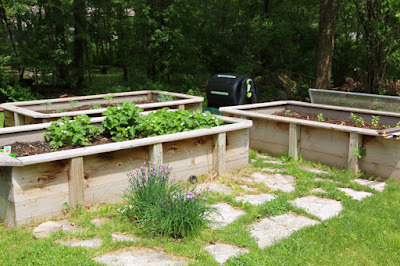 When I saw it I realized that big gardens can be just as part of a beautiful landscaping look as the raised beds were. 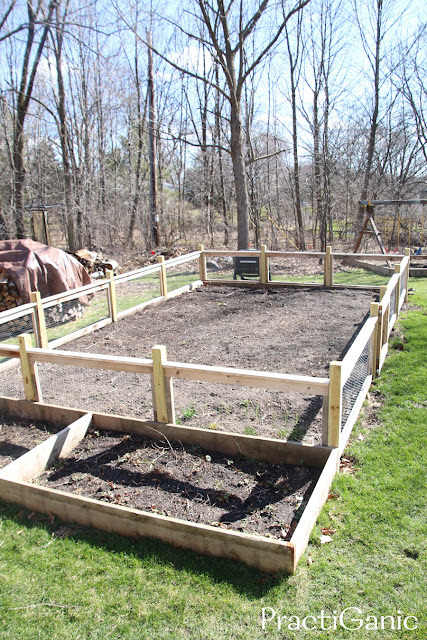 Luckily, Paul was on board, were were able to reuse the lumber from our raised beds and we didn't have to buy anymore soil simply by spreading around the raised beds. Easy Weeding: Weeding could not have been easier. I would simply sit on the ledge and pick away. Working all the way around the bed without having to be on my hands and knees. Then Why Lower the Garden? Wasted Space: After we realized all the space we were using up as walkways in between the raised beds we knew we were crazy. All that walkway space equaled loss of vegetables in our fridge! Larger Vegetables: In the raised beds, I never wanted to do many large vegetables: squash, pumpkins, etc. They would take up too much real estate in our precious area. 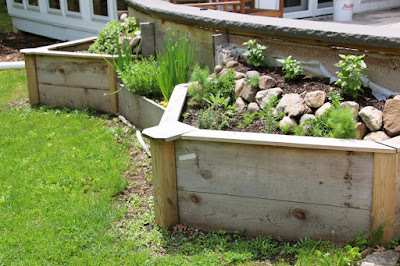 Still Pretty Landscaping: Lower beds can still look just as decorative as raised beds. I absolutely love our new look! Less $$ for Maintenance: With our raised beds, we had to add a lot of compost every because the soil height would drop down so much. 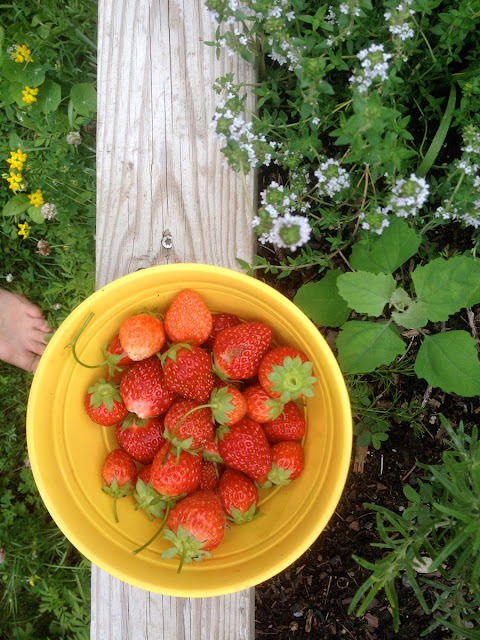 In our 4x8 ft beds, it would lower about 4 inches a year! Now, in the same footprint as the raised garden beds, we have TWICE as much room for vegetables in our large, lowered garden. We decided that with the extra space, we are going to try forgo our CSA membership too and really work on ours. Having multiple plantings. We will have to have a few extra trips to the farmers market but I really think we're going to be saving a lot of money in the long run! So basically, my conclusion is if you are planning a smaller garden with a few choice vegetables and herbs, a raised bed is perfect. They are easy to maintain and look great in the lawn. If you are planning a bigger garden with larger vegetables, don't waste your green space and make one large lower garden! Regardless of your choice, enjoy the fruits (and vegetables) of your labor!